Seattle’s 1989 attempt to acquire an NHL franchise provides an object lesson on why it has been so difficult for the city to become a league market. At least three Seattle-area investor groups interested in acquiring a National Hockey League team are in receipt of expansion applications that will cost $10 million apiece to fill out — with $2 million non-refundable. If Ray Bartoszek (Tukwila), Chris Hansen/Victor Coleman (Sodo) and either one or two unidentified parties in Bellevue opt to proceed, they will get a chance to own a club for an outlay of $500 million. If Seattle’s previous tango with the NHL is any guide, now comes the hard part. In 1989, another group of investors with Seattle ties jumped at a chance to acquire a franchise when the NHL announced a two-city expansion for the 1992-93 season. Eleven investor groups in 10 cities (two in San Diego) applied. At the time, the league charged $100,000 for a simple application, $35,000 non-refundable. That apparently suited Seattle Thunderbirds owner Bill Yuill, Bill Ackerley of Ackerley Communications (owners of the NBA Sonics), former Seattle Totems official Bill MacFarland and Microsoft executive Chris Larson enough to proceed. They all gagged at the $50 million expansion fee, which was at least $5 million more than the highest-valued NHL franchise of the day. The NHL told Yuill et al that if it accepted the application and awarded a franchise, they would have to fork over a $5 million down payment in 30 days and would be on the hook for two installments of $22.5 million each, payable in June and December of 1990 to complete the deal. 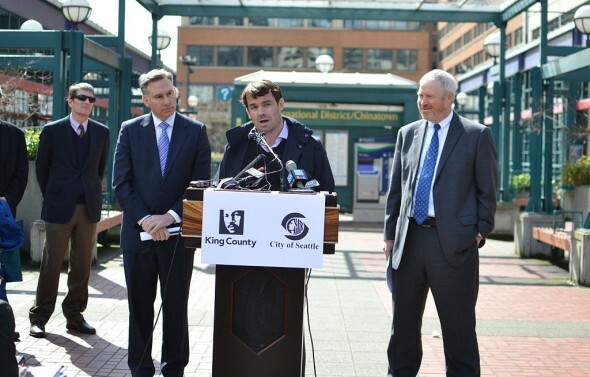 Intent on adding hockey to the Seattle sports mix, Yuill et al bulled ahead, as Bartoszek, Hansen/Coleman and perhaps Bellevue are expected to do now. But the 1989 investors soon found draconian the NHL’s additional requirements for a franchise. They provide an object lesson on why it has been – and will continue to be — so difficult for Seattle to become an NHL market. The $5 million down payment, the NHL declared, would be forfeited if the new ownership group failed to sell 10,000 season tickets within a year. Among 1989 Seattle investors, that caused a major pause. Then in their 21st of 41 seasons, the Sonics never had more than 9,000 season-ticket holders. The NHL further demanded that season ticket sales generate at least $9 million annually, which translated into an average ticket price of $22.50. At the time, Seahawks tickets averaged $15-$35, University of Washington football tickets $8.50-$20, Mariners tickets $5.50-$10.50 and Sonics tickets $5-$25. Thus, the new NHL team, with no track record, would have the second-most expensive sports ticket in town. According to 1989 NHL requirements, a expansion team had to either own its own arena or have a 20-year lease with what the NHL described as a “substantial” (the NHL didn’t define substantial) share of revenues from concessions, parking and advertising signage. None of the 1989 investors owned an arena, although the Ackerleys were planning a new one, nicknamed “Ack Dome,” slated to go up in Sodo. Sonics owner Barry Ackerley, who sought to become a minority hockey owner to max his investment, balked at taking a “substantial” share of concessions, parking and advertising signage away from his Sonics and giving it to a new hockey team. And he especially didn’t want to share luxury box revenues, denied him at the aging Seattle Coliseum (now KeyArena). The NHL further mandated that Seattle investors secure a $5 million line of credit – we can only speculate on what that sum would be today — in the event the league had to take over the team. The NHL also stipulated that an expansion franchise receive priority status in postseason arena dates. Whether the Sonics continued in the Coliseum or relocated to the Ack Dome, Ackerley wasn’t about to give an expansion hockey club, even one in which he had a minority interest, more favorable playoff dates than he gave his Sonics. Sure, Ackerley chopped down city-owned trees that obscured Ackerley Communication’s billboards, but he wasn’t stupid. For a moment, put aside today’s application fee ($10 million), franchise cost ($500 million), terms of payment (whatever they may be), letters of credit, concession and parking revenue, and luxury-box income. Assume that arena construction, on Bartoszek’s Tukwila site or Hansen’s Sodo parcel, is not an issue, even though it most assuredly is. If the NHL does today what it did in 1989 — and there is no reason to suspect it won’t — it will demand that an expansion team receive priority playoff dates in whatever arena is constructed — especially in the absence of an NBA team. How can, say, Chris Hansen agree to that? If he bows to the NHL on priority playoff dates, he will compromise his chances of acquiring an NBA franchise, which would insist on priority playoff dates as a condition of expansion/relocation. Ten NBA and 10 NHL franchises currently share an arena, notably Madison Square Garden in New York and the Staples Center in Los Angeles. The NBA says what goes in all of them. All of Seattle’s potential investor groups must satisfy NHL franchise requirements in order to get a team, but do so without creating roadblocks for an NBA expansion or relocation. That won’t be easy if the NHL runs this expansion process the same way it ran the one in 1989. And the current process has started out exactly like 1989. Back then, the investors ultimately split into two camps, the Ackerleys in one, Larson and McFarland in the other. And then they loosely joined forces in order to present a united bid. Since they believed – incorrectly, as it turned out – that the NHL wanted Seattle as part of plan to add more West Coast teams, they figured they might be able to negotiate the NHL’s $50 million expansion fee down to something more reasonable, into the $35 million range — that based on sales prices for the Minnesota and Hartford franchises the previous year. “A lot of people are looking at whether a $50 million expansion fee can be done,” Chicago investment banker Bill Lear, who helped assemble the Seattle ownership group, told the New York Times. The NHL made none because, as it developed, it had a couple of fish on the line willing to be hooked and gutted. Even so, Seattle’s attempt to acquire an expansion team remained alive in late November after the 11 ownership groups from 10 cities had been whittled to four candidates. But the whole thing fell apart Dec. 5 when MacFarland, Larson, Barry Ackerley and Lear traveled to West Palm Beach, FL., to meet the NHL’s Board of Governors at the Breakers Hotel. They went there to present their case for acquiring a team, but came away with nothing in one of the great mixups/mishaps in Seattle sports history. Even if that epic boobery hadn’t occurred, the Seattle bid group was not willing to meet the NHL’s expansion requirements despite having the economic net worth to do so. It determined the NHL and Seattle was a bad marriage under NHL-imposed conditions. As it will be this time around, based on the NHL’s own history. He was referring to concession-parking-signage-luxury box splits and priority playoff dates — the same land mines awaiting Chris Hansen, Ray Bartoszek and Seattle’s other NHL suitors as they enter the sporting equivalent of the Mekong Delta – and they don’t even have arenas yet. So don’t submit your entry into a “Name The Team” contest just yet. Great article! I was too young at the time to remember what happened with that bid effort but it is clear that there is a distinct probability that this process will be as much of a stickup as the last one. I really want the NHL to come to Seattle and the one thing I will point out is that it won’t get any cheaper the longer we wait to get a team. Hopefully the groups involved can come to terms that are acceptable to everyone. We’ll see how it goes. Following various arena saga for pro sports over the years, especially with the Sonics and the NHL’s continuous flirtation with Seattle, I’ve learned the only rule professional sports follows is that they follow where the money is. And they’ll do anything to go where that money is. (Yeah FIFA, I’m looking at you.) But even that rule has it’s exceptions as the NBA has continuously shown with Seattle. So the only thing that can top money is ego. For the NHL to finally come here there needs to be a politician to come forward and lead the way Slade Gorton did for the Mariners. Then someone with a lot of money to lead the group. I had no idea in the past Chris Larson had some interest. He’d be a great person to fill that role if at all possible. I don’t care, I’m going to submit my entry for a name and it’s not terribly original but again, I don’t care: the Metropolitans. If fans can demand the Sounders name live on so can the Metropolitans. I don’t understand people’s obsession with naming the team the Metropolitans. The team wasn’t even here for ten years. To me this is just people trying to cling to a moment in history and glorifying it beyond what it ever really was. We don’t need to name the team the Metropolitans for every announcer to point out that a Seattle team was the first U.S. Team to win the Stanley Cup, I guarantee you it will be mentioned regardless of the name. I expect the new team to create their own history and traditions. Which is the main reason I’m a bigger fan of other names like Kraken or Kodiaks or Dire Wolves. Anything but Metropolitans. When the Sounders owners held a name the team contest before the club came to be they had several choice for fans to choose from, Sounders was not one of them. Sounders became the name on a write in vote. It’s the same reason. If the T-Birds weren’t around I’d want their name and logo to be it. If the NBA awards a franchise to Seattle fans will want the name to be Sonics despite the fact it’s history closed on a sour note and the name comes from a failed Boeing project that had it’s funding yanked out from. In both instances it’s fans having fond memories and respecting history. Same principle for Metropolitans. They did win a Cup. Be a reason to hoist a banner. I don’t see the two situations as parallel. The Sounders were here just a lower level of soccer starting in 1974-1983 and were then re-established in 1994-2008 in the APSL and then the name transitioned to the MLS squad when it was established in 2007. You’ll notice that there wasn’t a 100 year gap between teams using the name and about 20 years of history. The reason it won the write in was because that’s the name people here who followed soccer knew. The Sonics had over 40 years of history and have only been gone now for 7 years which means most people who were fans are still around and remember the team. There probably aren’t ten people alive today who remember watching the Metropolitans today and, if they hadn’t won the Stanley Cup after stealing a contending team, no one would remember them at all. As it is, they are nothing more than an answer to a trivia question. I’m not going to tell you that you shouldn’t want the called the Mets but I would challenge you to ask yourself why you think it’s a good name? Is it because you truly think it’s the best name and represents Seattle and our interest in hockey? Or is it because you feel the need to try and validate the new team and Seattle hockey on the merits of a team that played here 100 years ago and no longer exists anywhere except in the dusty pages of NHL history? I disagree. I just like the Metropolitans name. One big difference between then and now: the NHL was under the watch of a different head, President (not commissioner) John Ziegler. Best thing someone said about him was that he was “a true non-visionary in every sense of the word”; the worst thing is that he makes Roger Goodell look competent. Current Commissioner Gary Bettman will have much more reasonable expansion qualifications, by default. As for names, I much prefer “Totems” and then “Pilots” if “Totems” fails sensitivity tests. Since the NHL has a Metropolitan Divison (New York, Philly, et al. ), I’d save “Metropolitans” for throwback nights. Then again, we could approach this the same way Minneapolis/St Paul did to get Super Bowl XXVI. The story goes that Seattle had a bid in to the host the game, as did MN. The NFL had requirements about seating capacity (and probably corporate suites). As I remember the story, Seattle was honest and said the Kingdome couldn’t accommodate the requirements and MN lied and said they could (which the ultimately didn’t deliver on). Of course the Super Bowl was held in MN instead of SEA. There’s an old adage that it’s easier to ask forgiveness than permission. If you’re going to sit in a den of thieves, maybe it’s best to just try and fit in.